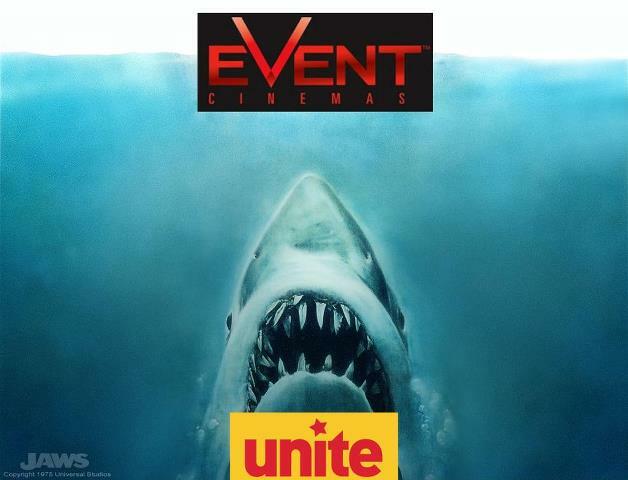 Talks with Event Cinema management and Unite Union broke down on Tuesday May 22nd, as the company refused to improve on the offer rejected by union workers on all sites in New Zealand. The big bone of contention is that the rise in the minimum wage of 50 cents, a 3.85% increase, is not matched at other rates. Cinema Attendants with more than 18 months service have only been offered an additional 30 cents, projectionists have only been offered 29 cents, and duty managers not in “Tier One” sites only offered between 31 and 35 cents, despite doing the same work. Contrast this with the offer on the table from Hoyts, where they have offered a blanket 50 cents increase on all rates. 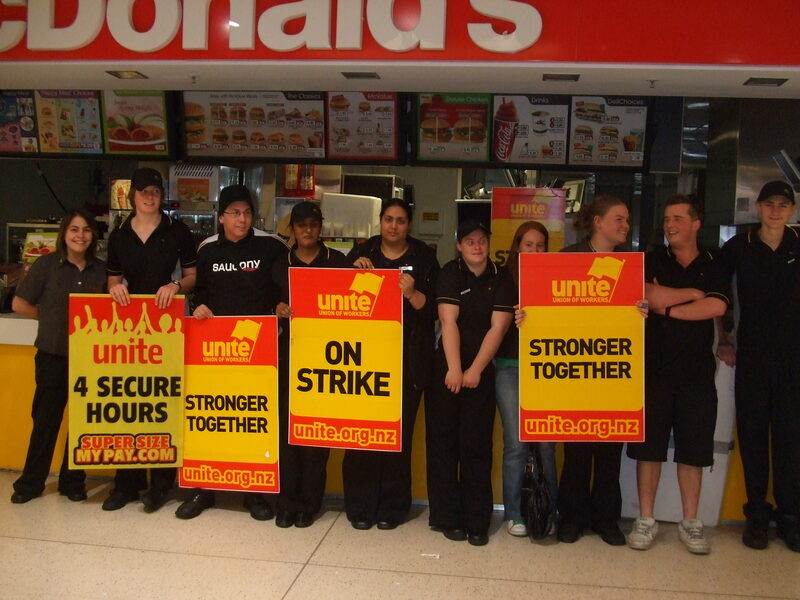 The union has also just negotiated a very good offer from Restaurant Brands, which in addition to a pay rise and the reintroduction of an overtime rate of time and a half after eight hours worked, also sees a union only benefits package being offered. Unite Union members will also receive a 72 page discount booklet; a Christmas hamper each year; life insurance for members ($5000 for a member and their spouse, $2000 for members children); a day out at Rainbows End or some equivalent. These benefits are only for union members. 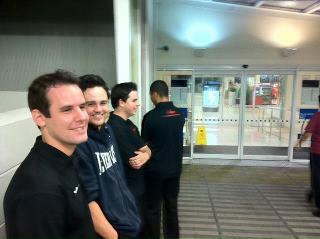 This shows us what the union can do when its membership is strong and united- many of our KFC stores are 100% union now. 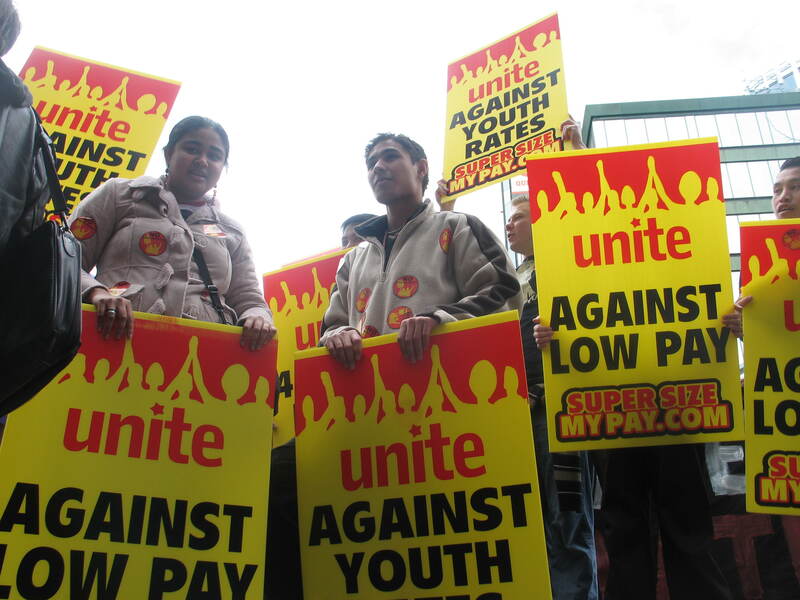 IS NEW ZEALAND A LOW PAY COLONY? The union, in the interests of equality, cannot accept such a low offer from Event Cinemas, at a time when our other workers in Hoyts and Restaurant Brands are getting much better deals. It is disappointing that the Australian private equity group that runs Event from their offices in Sydney has such contempt for its Kiwi workforce- is Aotearoa just a low pay colony of Australia? Compare the rates Event cinema workers earn in New Zealand with their counterparts across the Tasman. 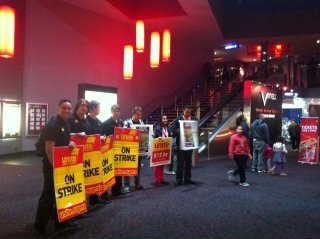 These workers do the same work, sell tickets at the same price, and box office takes the same levels of profit, yet they earn heaps more. 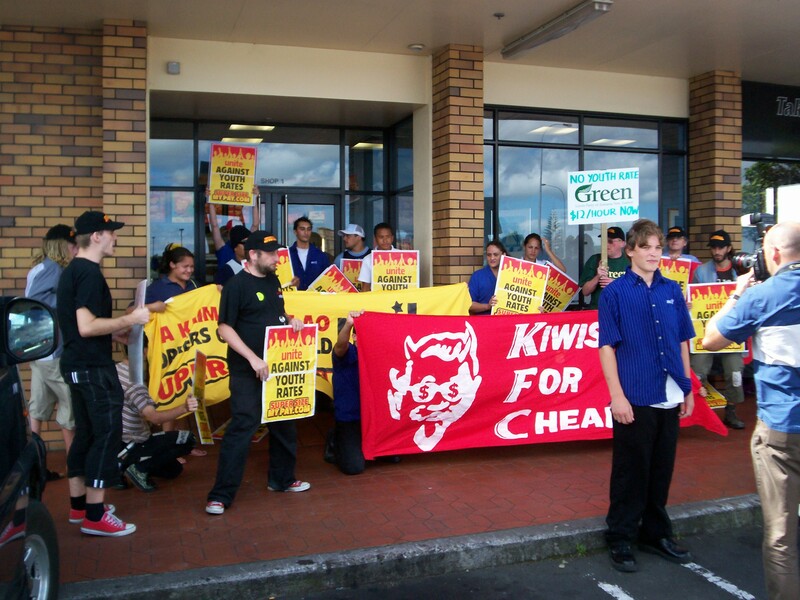 Back in NZ, Some of the supermarkets organised by the First Union now have a starting rate of $15 per hour. There is huge consensus in society now that pay is too low, and a campaign for a Living Wage launched on May 23rd has received massive backing from community groups, churches, political parties and unions. 30 and 40 cents increases are an insult to workers, at a time when the cost of food, petrol and rent are going through the roof. Union members are right to reject this offer, but now they need to organise like never before to take on a company that doesn’t care. Up until now, the Union has organised some boisterous, good humoured strikes and protests around the country. (see pictures) Queen Street led the way on May the 1st, and was joined by strikes in Westcity, St Lukes, Rialto, Albany, Hamilton and Wellington. 9 out of 10 workers went on strike at Westcity, and 5 out of 7 in Hamilton. 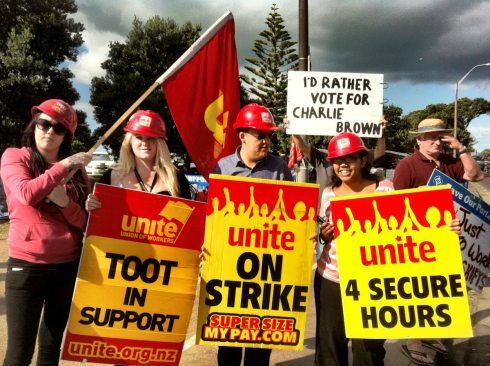 Everywhere except Manukau, where site management have taken a very hard line against the union, the union has recruited new members and the delegate leadership has gotten stronger. In the next few weeks, more members will be joining in on the action to make sure we get equality with Hoyts, and win a living wage. We are also going to go after the company’s brand. Not only do they pay Kiwi workers a lot less than their Aussie cousins, but they charge exorbitant prices for popcorn and ice creams. 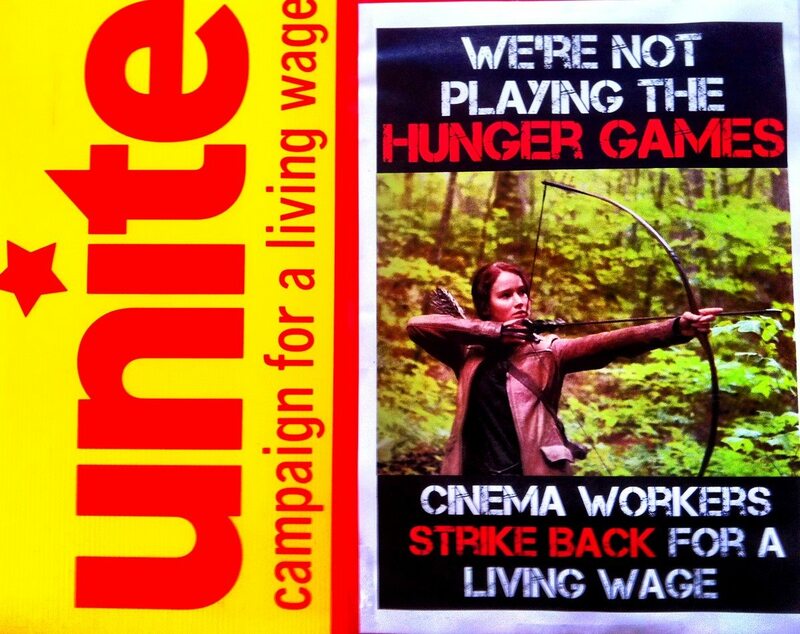 The union will run campaign stalls outside cinemas educating Event customers about these facts, and ask them to join a “Popcorn strike”- boycotting the rip off products at candybar in favour of cheaper alternatives. We will ask workers, students and activists to help staff these stalls at busy trading times. The union can keep this up forever, and as it impacts on the company’s brand, will see a reduction in the profits it makes. This is the only language Head Office will understand. If you or your friends would like to help. txt Joe at 029 4455702. – Term: One year deal from April 1, 2012 to March 31, 2013. Then we negotiate again. – There are no claw-backs in this new agreement – only improvements for members. Note: Start rate already moved at April 1, and 320hrs-18mnths position already moved 20c at April 1 but moves a further 30c resulting from agreement back-dated to April 1. – All new rates above are backdated to April 1, 2012, for union members only. – Rates for staff on individual agreements will not be reviewed until September 2012 and therefore union rates will not be passed on for a good period of time. – Early-outs: Company agrees that it will only send workers home early from a rostered shift by mutual agreement. – 15 minutes is the length of the break that will apply for shifts up to three hours in duration and also at least two hours in duration. – Employer will pay overtime (time and a half) for hours worked on the seventh consecutive day of work where the employee has not volunteered to work the extra shift (i.e. a shift- swap to work on the seventh day will not qualify the employee for overtime rates). – Employer will pay overtime when there is less than nine hours rest between shifts where the employee has not volunteered to work the extra shift (i.e. a shift- swap to work on the seventh day will not qualify the employee for overtime rates). – Employer agrees to cease previous limited practice of unpaid trials. – New disciplinary procedure clause provided in union agreement. – Unite proposal on union services will be considered by employer. – New employees clause will be amended in case of a government change to 30-day provision in the Employment Relations Act (which currently puts new employees on the same conditions as the collective). The union will amend it’s new employees form subject to company approval.